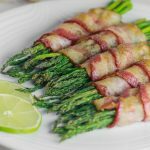 If you’re used to roasting asparagus, today, let’s try an appetizer dish with the crispy bacon-wrapped asparagus that is conveniently roasted in the oven and works on the grill too. 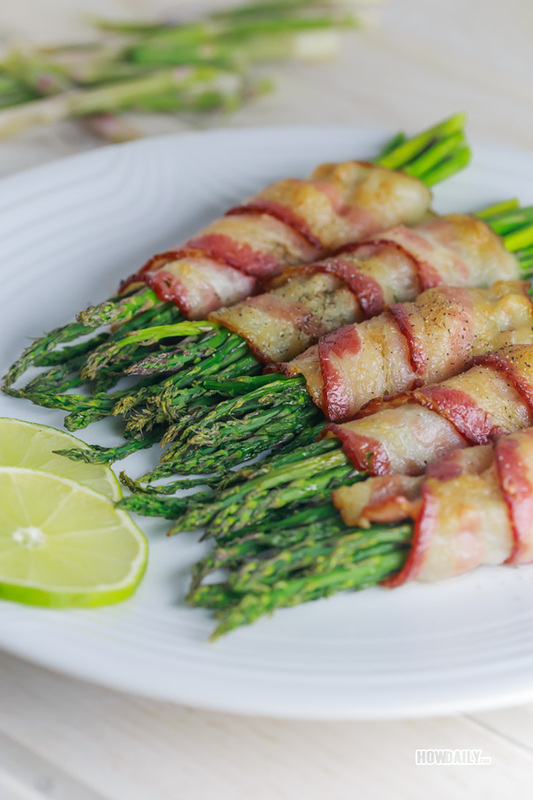 Just imagine this, crispy bacon on the outside tying a bunch of perfectly cooked green, tender but not smushy asparagus. The taste will be light, a bit of everything from salt, honey, pepper, lemon juice and seasoning with olive oil. Uhm.. sound great isn’t it?! The challenge about these roasted bunches is that asparagus tend to be cooked way before bacon become even crispy, hence, smushy. Thus to counter that problem, you could try either pre- pan-roasted or oven roasted them lightly before wrapping. 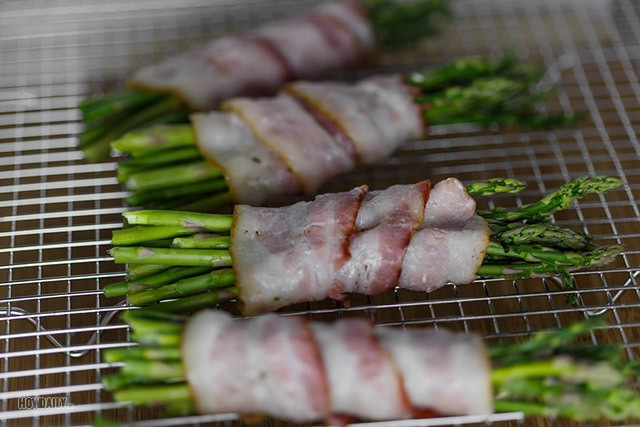 So when we pan-fried or oven roasted the bacon strips, those extra moisture will be evaporated enough to let the bacon become crispy faster when roasting together with asparagus. 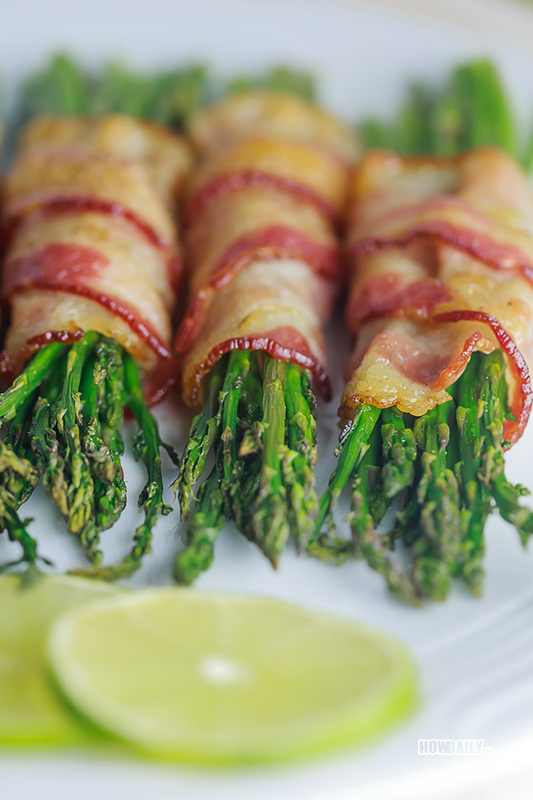 A combination of crispy bacon and perfect cook asparagus brings joy to the family meal. Snap off ends, remove skins, wash and pat asparagus dry. In a bowl, toss asparagus with 1 tsp olive oil and 1/4 tsp salt. Shake them good and set aside. Arrange bacon strips onto your roasting rack (prefer for even heat distribution without turning). Turn on your oven. Place bacon strips rack into oven before it preheating process (to 400 F), let pre- roast for about 4 minutes. This will help to remove some extra moisture in bacon. After bacon just turn a little crisp but still flexible enough to wrap, get them out and let cool down. If you're using a lined pan to pre-roast bacon earlier, turn the strips upside down. Glaze these strips with some honey or maple syrup. Wrap each strip around 4-8 stalks of asparagus (depend on size) and place them back onto roasting pan/rack. Roast for 10-15 minutes until all bacon is crispy. When done, remove from oven and sprinkle on some ground pepper. Season with lemon juice before serving if desired.